One night in 1959, Laura Manion (Lee Remick) returns home and tells her husband that she's been raped. Enraged, he husband grabs a gun and kills the man she accused of the crime. When arrested, Frederick Manion (Ben Gazzara) claims that he didn't remember any of it, but nobody really believes his story. His wife turns to a relatively unknown country lawyer for help, and after meeting with the Manion's, Paul Biegler (Jimmy Stewart) agrees to take the case. It's never clear whether or not even he believes his client's story, but either way, Biegler is determined to get the man exonerated. Many law professors consider this film to be the most accurate depiction of a trial ever fictionalized on film. 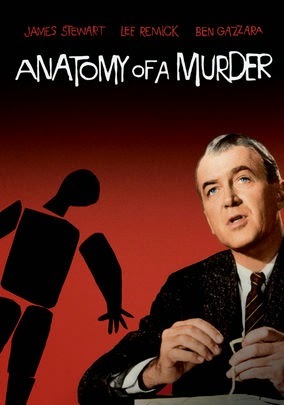 Likewise, the Academy was also very impressed, giving Anatomy of A Murder seven Oscar nominations, but does the film really stand the test of time? For 1959, the Manion's were as promiscuous and dysfunctional a couple as could be on film, however in 2015, they are rather tame. That's not the only thing that gets lost in time, as the laws surrounding the insanity defense have also changed, making the whole premise around this trial more than somewhat outdated. This film simply doesn't have the impact in 2015, that it did in 1959, but that doesn't mean it's not entertaining. Jimmy Stewart stars as Defense Attorney, Paul Biegler, who unfortunately isn't the most interesting man in the world. He's a very bland character, without much depth, but he is an intelligent lawyer, who finds every trick and loophole in the book to defend his client. Jimmy Stewart was a tall lanky man with a strange voice, who I thought was a natural when it came to physical comedy, but Stewart preferred to play a more intelligent character, especially later in his career, and Paul Biegler is a textbook example of that. Anatomy of A Murder is on almost every top 100 list you can find, and in it's time it absolutely belonged there, but by 2015 standards, it's very long, tame, and outdated, despite the excellent story and depiction of a courtroom.